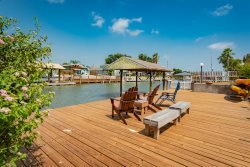 Homes that offer fishing piers are very popular with our guests. The homes found here offer private or semi private fishing piers. Most of the fishing piers are lighted for great night time fishing. If your vacation home does not come with a pier, there are several public fishing piers in the Rockport and Fulton area.